IAQ 8000 is trusted for use in duct work, to bridge and reinforce duct liner or duct board insulation materials, and to seal unlined duct work prior to component removal, preventing fiberglass and inanimate particulate from becoming airborne. IAQ 8000 forms a durable, flexible, moisture-resistant protective coating with a semi-gloss finish that minimizes dust buildup on the coating surface. The high viscosity provides maximum bridging ability on insulation materials and reduces sagging and dripping when applied to the vertical and top surfaces of unlined duct. Successfully tested to ASTM standard C-411 “Hot Surface Performance of a Coating on Glass Fiber Blanket Insulation”, ASTM E-84 Class A fire rated, meets requirements of NFPA 90A/90B standard. Clean and remove all dust and loose particulate from ductwork, being careful not to damage insulation. Follow duct manufacturer’s instructions for proper cleaning. Apply IAQ 8000 with brush, roller or airless spray equipment. Prior to application, mix thoroughly to achieve a uniform consistency. Apply IAQ 8000 to all surfaces by brush or airless spray. Application rate will vary depending on porosity of the insulation. Apply one coat by airless spray, or two coats by brush. Porous surfaces may require additional coats. Ensure that surfaces are completely sealed. Circulate fresh air through the HVAC system to help dry the coating. Exhaust air outside the building. 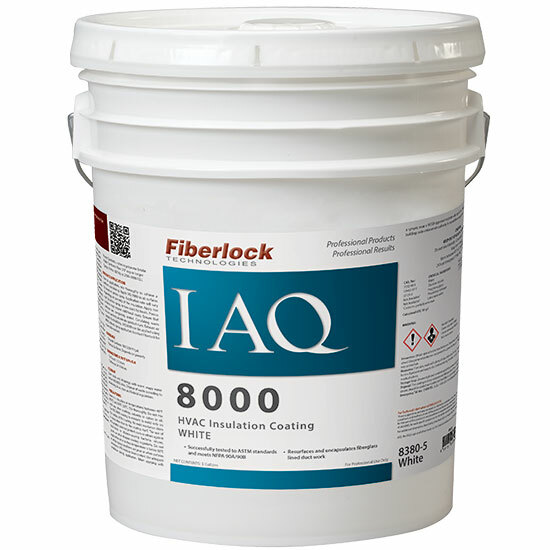 IAQ 8000 can be applied using HVAC robotic spray applicators (contact Fiberlock for more information). Clean tools and drippings with warm soapy water before IAQ 8000 dries. Dispose of all waste according to all existing local, state, and federal regulations. Store in a dry place at temperatures between 40°F (4.5°C) and 90°F. (32°C). Stir thoroughly. Do not mix with any other coatings, solvents or colors in oil. The IAQ 8000 coating is resistant to mold only on the surface of the coating. No mold resistance claim is made other than to the coating itself. The use of this product does not protect users or others against food-borne or disease-causing bacteria, viruses, germs or other disease-causing organisms. Do not apply when air or surface temperature is below 50°F, or when drying conditions are poor or when surfaces are above a 15% moisture level content. Use adequate ventilation during application. When applying with a sprayer, wear a NIOSH approved respirator with any R, P, N or HE filter. For interior use only. Check with local building code enforcement authority for any additional requirements.